Brenda Hoover, the new Head of our Parent Teacher Fellowship, spent some time answering a few questions for us. She shares her experience with having a daughter in kindergarten last year and what it was like finding community as a new family at the school. We hope you are encouraged as you catch a glimpse of Brenda’s generous heart! What are some aspects of our Kindergarten program that you find unique? Classical education is unique in our society, in and of itself. One of my favorite things to share with those not familiar with the school is that our daughter learned to write cursive in Kindergarten. People are shocked when they hear this, realizing so few kids learn this at all in other schools. I also love that the Word is embedded in all of their learning. I have so many fond memories of stories she would share with me and curious questions that enabled an ongoing conversation. 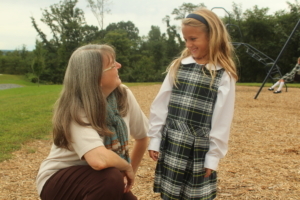 How have you seen your child grow as a result of being in Kindergarten at Covenant? I am not sure I have the words to describe the growth we have witnessed in our daughter. I think what stands out to me most is that she was challenged (academics, confidence, relationships) with an equal amount of love and guidance from her teacher. What was your experience as a new family last year? We are so blessed to have discovered Covenant Christian Academy. We were originally heading down a home-school path when we were introduced to the school. I cannot express the love and nurturing we received for our daughter as well as our family. When you walk into the school you feel an overwhelming presence of the Holy Spirit. It is a beautiful thing! Knowing our children will be able to experience this through graduation is such a relief as parents. It takes a village, and we are so excited this is part of our village! Tell us how the community at Covenant has impacted you. We began our journey in Pre-K. I will never forget meeting one of my new best friends that has become more of a sister to me. We both began to tear up while listening to the reading of The Kissing Hand. She handed me a tissue, and our families have grown so close! There are so many other parents that we have become dear friends with as well. It is beyond a community, it is a family of families. We are supported by staff, faculty, and all who attend. What inspired you to take on this new role? As Kindergarten Class Liaison last year I attended a PTF meeting to discuss Christmas gifts for staff/faculty. I realized parents of Upper School students were leading this effort. It stayed on my heart throughout the year. While it is tough to imagine taking on much more with our 3 young children and busy schedule, I felt nudged to explore opportunities. I feel it’s important for parents of younger students to begin to take the lead. I am not sure I realized I was being nudged for this particular role, but I am more than happy to do so and am excited for what lies ahead. Continuing to see our daughter grow and be challenged, not only academically but spiritually. I am also very excited to be more involved with the school and pray I can be a blessing to all the wonderful people that create this incredible environment.